Offering a fantastic base on the island of Sal, guests are only a short walk from both the main resort and the golden beach. It’s in a great central location in Santa Maria and just 10 mins from the beach on foot, providing the perfect base for a good value holiday in Sal. The pool provides an excellent focal point for the hotel. Wi-Fi is available free of charge; however, this is only available in reception and bar area. 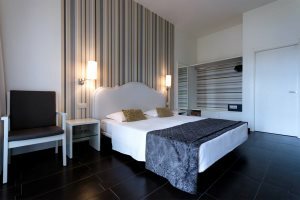 Hotel Pontão is a friendly hotel situated in the centre of Santa Maria, offering attractive accommodation for both couples and single travellers alike. 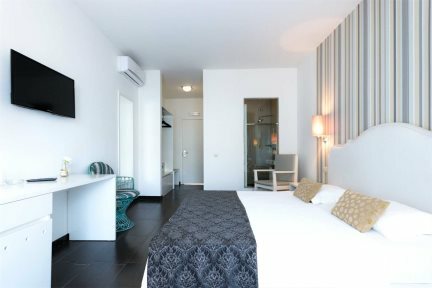 Pontão provides a fresh and contemporary look, along with improved levels of comfort, giving customers an excellent base for a beach holiday in Sal. Ideally located close to the central square with its growing choice of busy restaurants and bars, this hotel is the perfect choice for those wanting to sample the different cuisine options at hand and spend their evenings taking in the local ambience. A ten-minute stroll away is Santa Maria’s stunning beach, where beautiful turquoise waters lap at soft golden sands, and you’ll also discover an interesting pier, which each day comes alive with the local fishermen bringing in their catch of the day. Pontão hosts a total of 84 rooms, all set over two or three floors surrounding the central pool. The standard rooms are airy and spacious, while the smart superior rooms are newer and furnished in a more modern style (our pricing is based on superior rooms). There’s a bright and colourful bar area close to reception, where guests can enjoy a drink and make use of the free Wi-Fi, plus a breakfast room on the ground floor. A newly decorated, double/twin room that sleeps 2 adults with balcony or terrace overlooking the pool. Superior rooms are located on the ground, first or second floor. A newly decorated room with balcony or terrace overlooking the pool. Superior rooms are located on the ground, first or second floor.